If you follow this blog at all you know that Back to the Future is one of my favorite movie series of all time. I talk about it constantly. 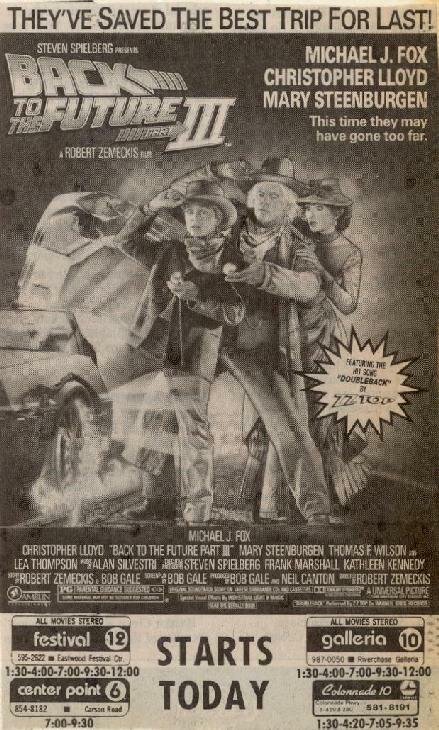 Well, today, Monday, May 24th, the second sequel in the trilogy, Back to the Future Part III turned 20 years old. Check out the newspaper clipping above. It was clipped from the Birmingham News on May 24th, 1990. So, since this is a momentous occasion (lots of classic movie birthdays this year), I’ll have a few Back to the Future related articles this week in celebration. Stay tuned and Happy Birthday, Back to the Future Part III. This entry was posted on May 24, 2010 at 8:00 am and is filed under 80s, Back to the Future, movies, pop culture with tags anniversary, Back to the Future, movies, pop culture, Time Travelogues. You can follow any responses to this entry through the RSS 2.0 feed. You can skip to the end and leave a response. Pinging is currently not allowed. I officially feel old. And I’m still in my 20s. I loved these movies growing up. Actually still do. Great Scot! It’s been forever since I’ve seen the 3rd flick. I think I’m going to have to get my cowboy Biff, I mean Buford, on.